A Silicon Valley startup is building a surveillance robot that it hopes will help security and law enforcement personnel detect trouble while remaining out of harm's way. Here's a closer look at five ways advanced robots can monitor commercial, public and private spaces. The components for a robot are all housed on one intelligent machine that connects back to a server over a high-speed network. When deployed, a robot must be engineered to act autonomously. Any flaws in the programming lead to serious repercussions. Knightscope is a Silicon Valley startup working on the K5 surveillance robot. Intended to help police forces in urban areas, at shopping malls or the parking lot of Google, the robot is one of the best examples of how autonomous helpers can augment the efforts of human security personnel. Stacy Stephens, the co-founder of Knightscope, offers some insight into how it works and how it could be used. The K5 looks a bit like the Robby the Robot from Forbidden Planet fame. Both have a coned head and stand about as tall as a human. (The K5 is 5 feet tall; Robby the Robot stands 7 feet tall.) The imposing look is by design. The K5 is intended to be the most critical part of what Stephens calls the "use of force continuum" – that is, a commanding presence. To stay within an area, security personnel use mapping software to create a geo-fenced perimeter. The K5 then moves autonomously (up to 3 miles per hour) and detects objects using two Light Detection and Ranging (LIDAR) sensors, which emit a laser in a 270-degree sweep every 25 milliseconds around the robot. The K5 creates a point cloud, such as a 3-D image of the surroundings showing the objects within the geo-fenced area. Unlike the GPS in your smartphone, which finds locations within a few meters from you, the K5 uses a differential GPS that finds objects within a few centimeters. That helps the robot know exactly where it's moving at all times. There's also an ultrasonic sensor for detecting objects close to the robot and a "wheel odometry" sensor to track the motion of its wheels. If a company deploys the K5 robot in a parking lot, one primary function is recording suspicious activity. To help, four HD video cameras can monitor and record in a 360-degree circle around the robot. Crucially, the K5 doesn't just mindlessly record activity. If there's a trigger, such as unusual or sudden movement, the K5 will record a video clip, stamp it with the GPS coordinates and alert the security guards. The Knightscope K5 surveillance robot is ideal for scenarios when it might not necessarily be safe for a human security guard, such as a dark parking garage. The K5 can scan 300 license plates per minute. In the Knightscope Security Operations Center, the security guards or the police force receive an immediate alert if the K5 detects a license for a known criminal. They can even inspect how the robots optical-character recognition system identified the plate, making sure there's a match. Since the K5 can work over a 24-hour period, infrared and thermal imaging sensors detect objects at night. One interesting feature on the K5 is the capability to compare real-time events detected with video cameras and motion sensors with social media chatter. Stephens says the impetus to adding this feature was the Boston Marathon bombings, when citizens took to social media to help law enforcement track the suspects. The K5 can "listen" for hashtags, keywords and other information and compare it to nearby objects and video feeds in a given area. For example, if the K5 patrols a parking lot late at night and detects a moving car, the robot can search Twitter for reports of a stolen car. The robot can even detect the license plate and then search for known criminals. The social media monitoring can be restricted to a specific location, since many Twitter posts include geo-location data. The Knightscope is a good example of how artificial intelligence is advancing. Stephens says the robot can learn over time. In a parking lot, the K5 might detect normal movements at certain times of the day, such as 5 p.m. when people leave work, and then determine that movement at 3 a.m. looks suspicious. The K5 also knows the movements of humans walking to a car or carrying packages but can detect when someone's crouching down next to a passenger door. The K5 can also listen for audio clues. Normal sounds throughout the day fall within a certain range of 80 to 90 decibels; if the sounds suddenly spike to more than 100dB, the K5 would alert security guards about a possible gunshot or explosion. Thermal imaging helps, too: The robot might learn that there was a loud sound followed by a bright glare from an explosion, or infrared cameras might detect movement in an area of a parking structure that has never shown movement before. Having a robot patrol a parking lot can deter intruders. But what if criminals try to tamper with the K5? Stephens says the robot is equipped with safety sensors to avoid collisions. If someone walks up to the robot, the K5 will initially stop and then move around that person. If the person keeps trying to confront the robot, it emits a mild warning chime and flash lights. 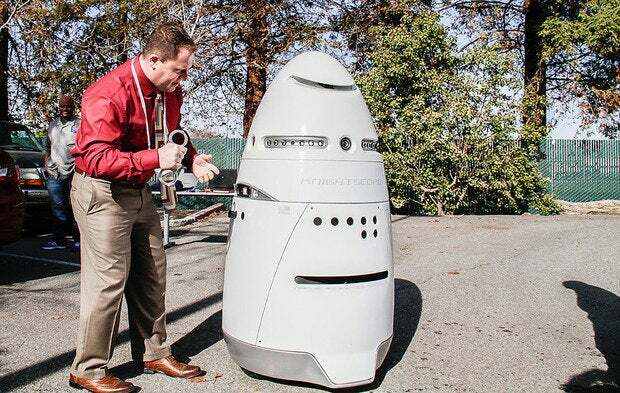 The Knightscope K5 surveillance robot is designed to interact with people. If they seem threatening, though, alarms will sound. If someone still tries to tamper with the robot, it can continue walking away and alert the security guards or police. However, if someone tries pushing the robot or removing a camera, the K5 can emit a piercing alarm to immobilize someone determined to cause damage. In most cases, by the time someone has approached the robot, the K5 has already reported the suspicious activity and alerted the police or campus security.